Visual illusions are useful to psychologists because, by tricking the brain, they provide clues about how it works. The same is true for weight illusions, it's just that they're far less well known. Now Gavin Buckingham at Heriot-Watt University has published a handy review of weight illusions, and he explores some of the thinking about their likely causes. Among the most studied is known as the "size-weight illusion (SWI)". When a person is presented with two objects - one large, one small - that weigh the same, the smaller object feels heavier. The illusion persists even when the perceiver is told what's going on. One explanation for the SWI is that, anticipating it will be heavier, we use stronger force to lift the bigger object than the smaller one. The greater force used to lift the bigger object leads to the perception of lightness, so the argument goes. But this explanation can't account for the fact that the illusion persists regardless of how many times we perform the lifts, and as we adjust our anticipatory force. Although the SWI illusion persists through repeated liftings, it can actually be reversed through extensive training. Buckingham describes a study in which groups of participants were repeatedly exposed to sets of "inverted-density" objects, in which it was always the smaller items that were heavier. One session of 1000 such lifts reduced the SWI slightly. Three days, conducting 1000 inverted-density lifts each day, cancelled out the SWI. 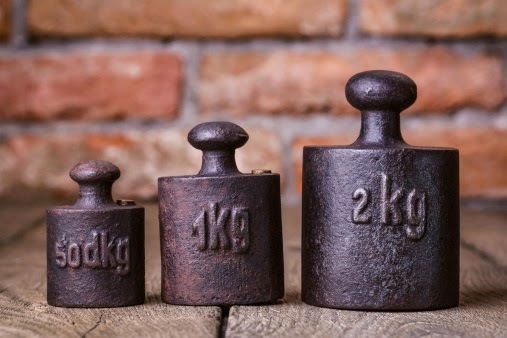 Eventually, after 11 days of 1000 inverted-density lifts a day, the SWI was actually reversed - that is, 11 days of a topsy-turvy world, in which smaller objects were always heavier than bigger ones, led these participants to experience the larger of two equally weighted objects as heavier. Also intriguing is the "material weight illusion". Objects that appear to be made out of heavier-looking material (e.g. metal) feel as though they are lighter than equivalently weighted objects that appear to be made out of light material (e.g. polystyrene). Related illusions include the "brightness-weight illusion" - light-coloured objects feel heavier than darker objects of the same weight; and the "temperature-weight illusion" which is when cold objects feel heavier than warm objects of the same weight. In one of the earliest observations of this effect, which you can easily try at home, Ernst Weber (1795-1878) described how a cold coin placed on the forehead of a supine person feels heavier to them than a warm coin. Here's one more illusion that demonstrates elegantly the influence of our expectations on our perceptions. Buckingham describes how researchers adjusted the normal weight of practice golf balls upwards so that their appearance was unchanged, but they weighed the same amount as real golf balls. To expert golfers, these manipulated practice balls felt as though they were heavier than the (equal weight) real balls. By contrast, non-golfers experienced no such effect - adjusted practice balls and real balls felt the same - presumably because they had no expectations that the practice balls would be lighter than the real balls. Visual illusions get a lot of attention - they're easy to share and discuss. Buckingham's paper provides a valuable glimpse (or feel) into the lesser known world of heaviness illusions. It's surprising to discover that the causes of many of these illusions remain controversial and mysterious. To take just one example, it's been shown that subjective, conscious expectations can't fully account for the size-weight illusion. The size of the illusion is the same whether it is performed with large and small metal cubes, or large and small polystyrene cubes - even though people's expectation "larger = heavier" would be so much stronger for metal than for polystyrene cubes. This tells us that something else is distorting people's perceptions of the cubes' true weight, other than their conscious expectations. "Future work should aim to determine the nature of the bottom-up influences [those pertaining to the nature of the object, or the forces acting on it] in weight perception as a function of the lifting task," said Buckingham, "in addition to identifying how these bottom-up effects interact with top-down expectations across the various types of weight illusion."